next US stock market correction like 90’s Japan Nikkie bubble? Could the next stock market correction / crash be like the 1990’s Japan Nikkie Bubble? What this momentous pivot really means, of course, is ill understood in the day-trading and robo-machine driven casinos at today’s nosebleed valuations. Yet what is coming down the pike is nothing less than a drastic, permanent downward reset of financial asset prices that will rattle the rafters in the casino. a variety of upcoming structural changes in the US economy compared to other world economies such as end of central Bank QE? increased globalization? the gig economy, automation and a graying US population and dysfunctional US Federal government. What are some of the risk factors? and what steps can you do to mitigate risks? Here’s a brief history lesson, like many economic bubbles a confluence of events led to the Japanese Stock market bubble and impending crash of the early 90’s.. Below the reasons most economists and observers believe that Japan’s stock market peeked on Dec. 29, 1989, with Japan’s Nikkei Stock Average finishing the year at an all-time high of 38916 . Rise of the Asian Tigers: A primary factor for the 1990’s stock market deflation of the Nikkie 225 was because of the coming of age of Japan’s neighboring Asian Tigers, this includes the technological , political and economic development of the four Asian Tigers (aka Asian Dragons) Essentially the highly developed economies of Hong Kong, Singapore, South Korea and Taiwan, reached maturity and some parity with Japan in the late 80’s early 90’s. They are termed this because they had very high growth rates (they became rich very fast) and fast industrialization between the early 1960s and 1990s. During this time they displaced much of the export muscle of Japan and its own corresponding industries. Declining negative working population / limited immigration: A continuously declining population especially working age population , meant less growth potential for the economy overall (less consumerism). As older and older folks left the work force and fewer , fewer younger workers entered or started families, coupled with pretty restrictive immigration policies, there was simply less folks to support stratospheric valuations. These and a variety of smaller factors led to the asset bubble in the early nineties coupled with the Lost Decade of economic growth in the subsequent years. The US markets next major correction causes will be TOTALLY DIFFERENT from those of japan 27 years ago, since economically , politically and regionally we’re very different from Japan of that time, rather it’s correction will likely be influenced by a new series of structural factors affecting the 2017 and beyond US economy. Overstretched valuations : By virtually any measure particularly using CAPE ratio (cyclically adjusted price to earnings ratio), Professor Shiller and John Campbell, the – compares a share price with the earnings of the company concerned over the past 10 years, adjusted for inflation – shows today’s valuations have been surpassed only during the build-up the dotcom bubble and 1929 Wall Street crash. US Consumer Debt / Student / Pension Funds: While Mortgage debt and the falsely grade-rated exotic financial instruments such as CDO’s created the last economic crisis. Today we are faced with even greater debt levels across many areas. Consumer debt such as student loans, home loans (yes those too) , municipal pension obligations are poorly funded or going bankrupt, aging population an increasing costs of entitlement programs. Automation/ massive jobs displacement: Related to the above reason , as more and more common job categories fall away to automation at a faster clip, we will be faced with an increasing disgruntled disenfranchised population that has little value to add or purchase from the economy. Aging population/ Entitlements imbalance : As more and more baby boomers leave the work force and begin taking their fair share from social program (social security , medicare etc.) and fewer younger worker fill in their spots contributing to entitlement inflows, a social imbalance where entitlements put a strain on the economy will materialize. Geopolitical instability: As always geopolitical “Black Swan event” could begin the snowball rolling down hill, even if the situation resolves itself quickly. My biggest worry is that the next correction, may be severe and worse it may be a while a long time IF EVER it returns to today’s heading valuation levels. 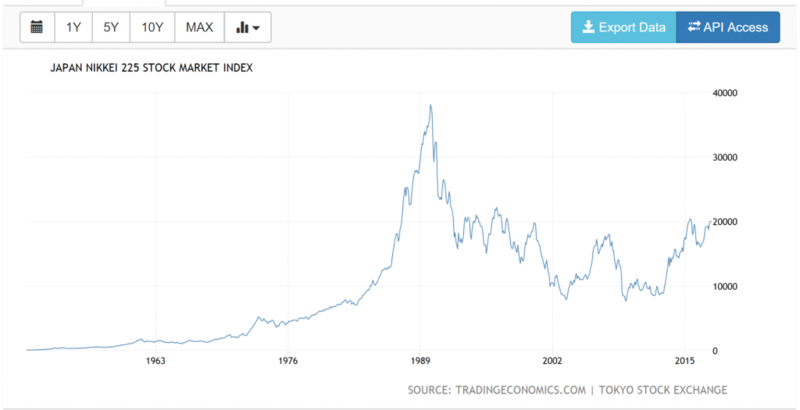 Think the market always trends upward, like the Nikkie 225 (Japan’s main stock index) circa 1990, look at the chart below it reached its peek of 38916 in December 1989 , it has never regained that value since then, let that be a cautionary tale. While 1990s Japan market had different headwinds back then, its still goes to show even a a modern western economy (the 2nd biggest at the time) is subject to this pitfall. Today 28 years and counting later , i t has yet recover even to 75% of that lofty valuation of 1989, that was 28 years ago! , how long is you’re time horizon? for more about this read the WSJ on the Japan Stock market bubble. Consider this, why should the US markets in 2017 be immune, to a long downward trend? the world is changing and the US while still having the largest economy is entering an era with the rest of the world has much more technological and economic parity with it. At the end of the day, while the above scenario may be dismissed by many, it depends on how risk averse you are and how much you have invested and how comfortable you are, so invest wisely.